99% of what the plugin outputs is editable from the form builder. However, there are certain things, like the “Write here” placeholder which you can not edit straight from the plugin. For easy localization, we have made our plugin internationalized (i18n) under the text domain ipt_fsqm. We have also provided a po file to get started with. 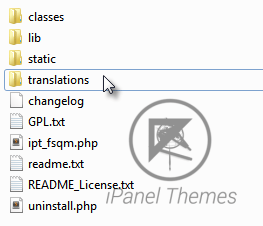 Under /translations/ of eForm plugin directory, you will be able to find a file named ipt_fsqm.pot. Please check the screenshot above and below. 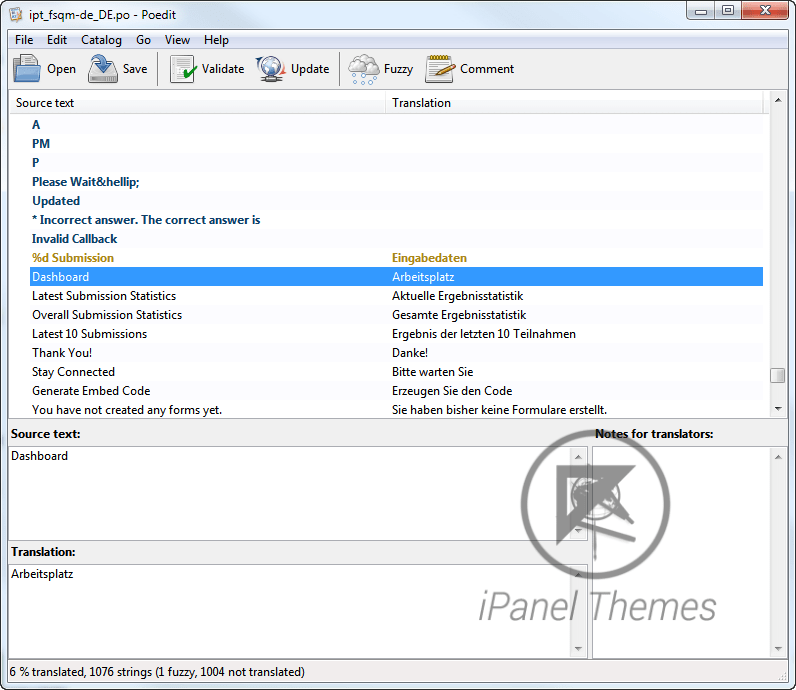 To translate you will need to download and install a freeware software named Poedit. Once installed open the ipt_fsqm.pot file with poedit and it should show you a window like this. ipt_fsqm: Which is the text domain of our plugin and it is fixed. de_DE: The locale of your language. For a list of available/supported locale please see this article on WordPress codex. Open the file again with poedit. Now go to Catalog Properties. Change the language from en_US to de_DE and click the OK button. Now click on individual strings and under the “Translation” textbox put your translated text. Do it one by one for all of the texts (or just the ones you’d like to translate). Once you are done, click on “Save” and it should generate ipt_fsqm-de_DE.mo file on its own. Now upload the ipt_fsqm-de_DE.mo and ipt_fsqm-de_DE.po files to your server inside the /translations/ directory of eForm plugin. 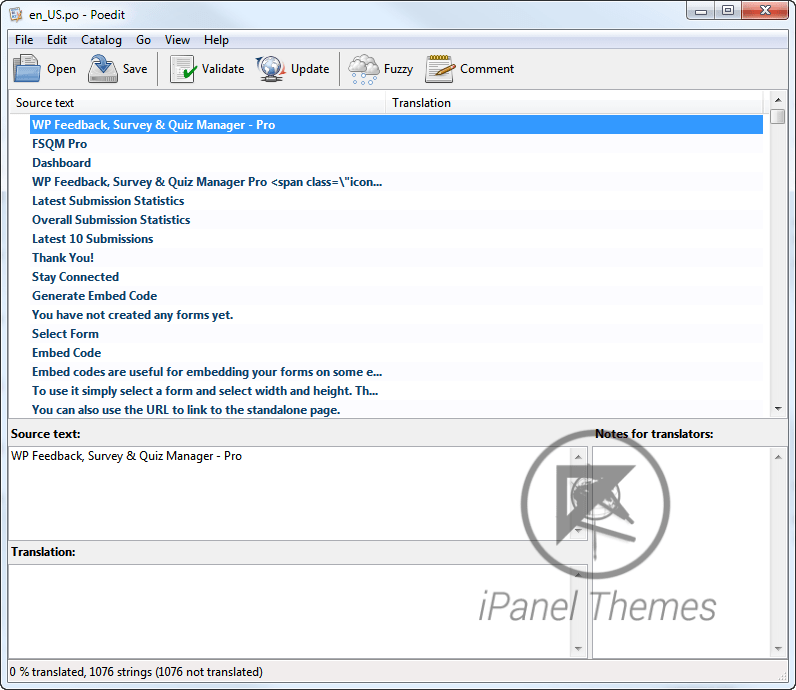 (wp-content/plugins/wp-fsqm-pro/translations). You should see the language change as soon as you upload it. If you still do not see it live, then probably you haven’t used the right locale or the locale isn’t set in your wp-config.php file. Please see Installing WordPress in Your Language. That’s it. If you are having any problem, feel free to contact us through support.